This is my 24th installment of Babywearing Stories 365. Each installment features a babywearer in 1 photograph and their answers to 5 questions. My goal is to normalize, promote and celebrate daily Babywearing, moving beyond *what* we use to carry our babies and shifting focus back on *why* and *where* we carry. I hope to share the stories of moms, dads, and babywearing caregivers all over the world. Enjoy! 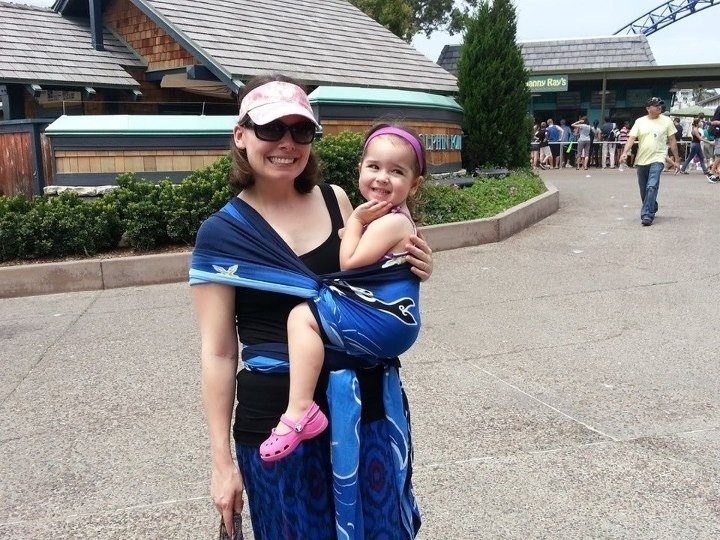 Packed my Wrapsody Stretch Hybrid Orca for the trip JUST to wear to Sea World! Since my daughter was 3, she was up and down a lot, so we used it most for quick ups and downs. Here, I have her in a (quick and sloppy, but it worked) Robin’s Hip Carry so that she could have a better view of feeding the dolphins. She might be three and maybe over the age that some people think kids “should” be worn, but my Jane still loves to be carried and what better way to hoist a toddler or preschooler who is too short to “see” or participate than having a carrier to help out with that!